Figure A86. Telkhinia anomalies, interpreted as the Telkhinia slabs, with (horizontal) [vertical] cross sections through (A)[D] the UUP07 p-wave) and (B)[D] the combined SL2013 and S40RTS s-wave models at 2010-2030 km; C) the location of the modern geological record that we interpret to have formed during the subduction of the slab. A north–south trending belt of positive wave-speed anomalies under the central Pacific Ocean has been interpreted to represent a series of Triassic-Jurassic intra-oceanic subduction zones, called the Telkhinia subduction zones by van der Meer et al. (2012) (Figure A86). These anomalies are detected in both the UUP07 model and S40RTS model in the lower mantle at depths greater than 1500 km. Three distinct intra-oceanic subduction zones were correlated to these anomalies. At these positions in the lower mantle seismic scatterers have been detected, interpreted to be caused by remnants of subducted and folded former oceanic crust under the central Pacific Ocean by Kaneshima & Helfrich (2010) and Ma et al. (2016) and under the northern Pacific Ocean by Schumacher and Thomas (2016). The tomographic analyses of van der Meer et al. (2012) and waveform modelling of He and Wen (2009) showed that the top of the Pacific LLSVP was essentially split as a result of sinking slabs. In both P and S-wave tomographic models, the amplitudes of the anomalies are weaker than for other slabs identified at equivalent depths associated with circum-Pangaea subduction zones. This may be explained by the proximity of the slabs to the hotter LLSVP (van der Meer et al., 2012). Subsequent tomographic studies corroborated the presence of central-Pacific lower mantle anomalies (Simmons et al., 2012; French and Romanowicz ,2014, Suzuki et al., 2016) or improved the imaging of the genetically related intra-oceanic Mendocino slab to the east (Sigloch and Mihalynuk, 2013). 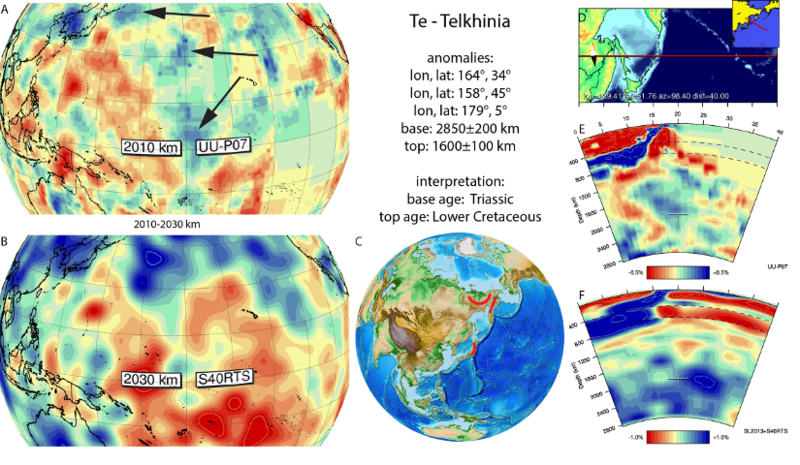 The Telkhinia slabs were correlated to exotic Triassic to Lower Cretaceous volcanic arcs now accreted in the far east Asian margin, currently incorporated in the Kolyma-Omolon and Andyr-Koryak arcs in Siberia, and the Oku-Niikappu arc in northern Japan (van der Meer et al., 2012). For this correlation, van der Meer et al. (2012) used the sinking rate of slabs of van der Meer et al. (2010) to interpret the Telkhinia slabs as the result of Early-Mid Mesozoic subduction, consistent with the age of these exotic arc relics. Paleomagnetic and paleontological constraints from these arcs provided an indication of their paleolatitude, and van der Meer et al. (2012) inferred their paleolongitude relative to the mantle by connecting them to the Telkhinia slabs. To avoid circular reasoning, we have not included the inferred ages of tops and bottoms of the Telkhinia slabs in our compilation used to constrain sinking rates of slabs in the mantle.